Step One: Apply SonicFill™ 3 and sculpt. Bulk fill restorations in one step. SonicFill™ 3 replaces conventional time-consuming, multi-stage layering techniques with a SingleFill™ Composite System that eliminates the need for placing a liner or final capping layer. And new advanced SonicFill 3 bulk fill features improved adaptation. It is even easier to handle, sculpt and polish, while also being simpler to extrude during placement, as compared to its predecessors. The end benefits are faster patient visits, more predictable results, and dependable, long-lasting restorations. 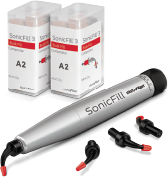 Get a special offer for SonicFill 3 by trading-in your current bulk fill product! Contact us at 877-685-1484 or your Kerr Sales Representative to receive your exclusive offer.